Horse power is being used at Harden Moor in West Yorkshire, as part of a project to trial natural flood management techniques to reduce the risk of flooding. 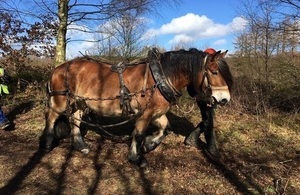 Ghalm is an 8 year old North Swedish Forest Horse, and has been recruited to the team to help move very large trees around the site to construct leaky dams. World Fish Migration Day are launching a film on May 16th 2019 to highlight migratory fish. Watch the trailer here to find out more about this upcoming film all about opening up our waterways for fish migration. The United Nations has issued a massive global ‘call to action’ to mobilize the political and financial support necessary to restore the world’s deforested and degraded ecosystems over the coming decade to support the wellbeing of 3.2 billion people around the globe. More than 2 billion hectares – an area larger than the South American continent – stand to be restored. How can better river management help meet Sustainable Development Goals? Cranfield University will be leading an international project to look at how better and more integrated river management could help deliver UN Sustainable Development Goals (SDGs). Read more about How can better river management help meet Sustainable Development Goals? WCSRT is seeking to employ a Catchment Partnership Manager to take on a pivotal role in our growing organisation. Allocated four-year PhD position at Queen Mary University of London available to start in September 2019. The successful candidate will start their project in September 2019 and will participate in training and cohort activities of the London NERC DTP. We are so excited to announce that the first CROWDFUNDED barrier has been removed!! The Crosthwaite Culvert in Northern England needed 10.000 donated funds and we did it together! By opening the stream, it is hoped that it will be colonised by aquatic plants, insects and fish species. They are also installing an educational freshwater pond where local, young students can come learn about the freshwater environment and species! This is an amazing project and ambition that would not have been possible without the generosity of the people who are investing in the rewilding of our future. An Environment Agency led research team is close to understanding the spawning and migratory route of the critically endangered European Eel. The actual location of the eels’ breeding area has never been identified. Locating it could be a critical step in protecting the species.